It was a normal morning at first. Brian woke up happy and we started to get dressed for the day. We talked about the weather and how much fun he was going to have in school with his friends. We wondered if he would get to play on the playground before the rain came later. I asked him what he wanted for breakfast and expected the usual - cereal or pancakes. "I really want a bagel and a muffin," he responded - much to my surprise. "Buddy, we don't have any bagels or muffins. Sometimes you and Daddy get one on the weekends, but it's Tuesday. We never have bagels and muffins during the week," I answered... and began to move on to the kitchen. I could hear him softly sniffing and turned to see HUGE tears falling from his eyes. Lots of kids cry. Some children cry a lot. Some parents stop reacting after a while because their child seems to cry over everything - especially when they don't get what they want. I get that. I do. I sat on the couch and pulled him into me. I didn't ask him to stop crying. I just held him and valued his feelings as if they were my own. Real and important and raw. I didn't talk. I didn't have to. "I just really wanted a bagel and a muffin." he sobbed. "I had a dream last night I was eating a bagel with Gavin." I didn't talk. I didn't have to. I just let him cry and I showed him that he could trust me with his emotions. He sobbed into my chest for several minutes. Once he cried his last tear, it was on with the day. He ate a bowl of cereal and a big bowl of grapes and off we went to school... singing to the radio and pointing out the flowers in the park as we drove. Driving home with Hope, I couldn't stop thinking about our morning. I could really learn a thing or two from Brian. He may not have had the words to really explain what he was feeling - it obviously wasn't about bagels or muffins - but he felt it, expressed it bravely and then moved on. I thought about my Mother's Day. By all accounts, I had a lovely day. Brian and Ed made me a homemade card. While I ran to the grocery store, Ed took some sweet photos of the kids after getting them dressed. 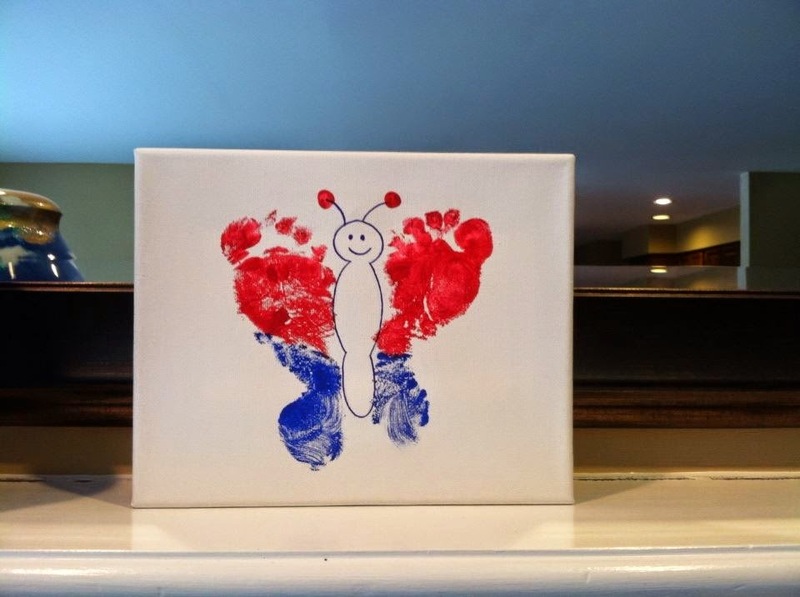 And he made this beautiful painted butterfly, which now sits on our mantle! Mother's Day morning, we went to my sister, Bean's, for brunch with her family and my Mom. My brother in law, Jim, made a wonderful breakfast (With Scrapple!! Who doesn't love Scrapple!!). I took a cute picture of him with Hope. I took another picture of my beautiful Goddaughter, Shannon, with Brian. We had to leave a little early because Ed had a flight out of town for a short business trip (he's already home). After he left and I was putting the kids to bed, I started feeling pretty damn sorry for myself. "I was running here and there all day - so much for a relaxing Mother's Day." "My first Mother's Day with Hope and I didn't get a single photo of the two of us together - or me with both kids - or my own Mother, for God's sake!" I was running here and there by choice. And if I had wanted a picture with me in it, it would have been as simple as handing my camera to Ed. But it's not about running... or pictures... or bagels. Sometimes it's easier to act out than look in. When you're five and don't have the insight or the vocabulary - or when you're 44 and you're supposed to. I hope one day when Brian and Hope are older they will read this entry and know that it's never too late to learn and grow. You're never too old to develop your vocabulary. And you should never be too proud to admit that some of the deepest and most important life lessons are learned from your children. At least that's what's happening to me. Thank you for sharing these learning moments....I think we teach other and our children so much when we are humbled and learning too. I wept through this post. I also was frustrated this Mother's Day as our 11y/o son is battling osteosarcoma and he spent Mother's Day in the hospital for chemotherapy and our family could not be together that day. My heart was breaking and I'm afraid I acted out too, instead of looking in and seeing that pain for my own selfishness. Thank you for sharing this moment of your life for it helped me to see my own moment was not my best, but that I can learn from it and grow as a person and a mom helping her son cope with a pretty tough battle right now. This is new territory and I'm afraid that I don't feel very comfortable in this "land". Thank you for sharing, Kate. Thank-you, Kate, for reminding us about life lessons and how we can truly learn from our children, just by paying attention and being 'tuned in' to their needs and feelings. 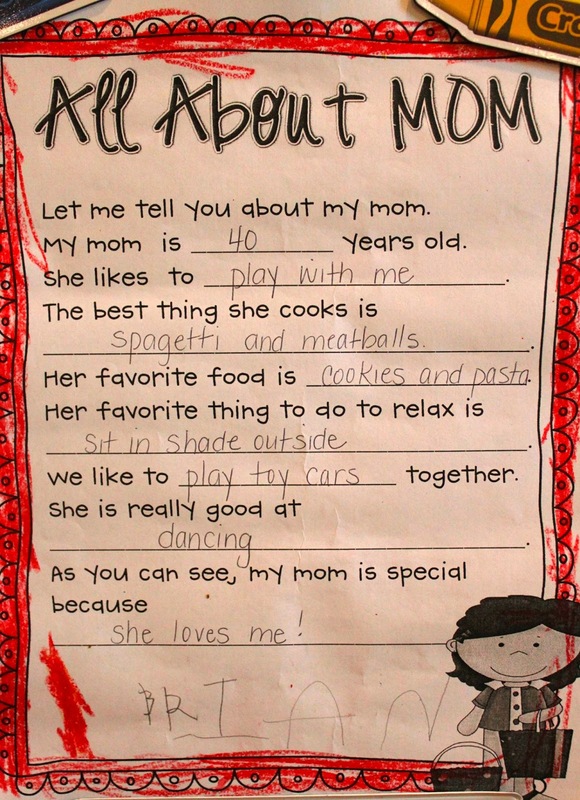 I have had some "not-so-great" Mother's Day moments in the past, but nothing compared to the heart break you, Ann (from comment above) and many other hurting Moms have had. My heart goes out to all struggling Moms...on Mother's Day and every day. Sending hugs & love. Thank you for sharing the life lesson today. A much needed reminder. oh my gracious.. what a life lesson.. "sometimes it is easier to act out than look in" my new mantra when listening to my teens(and the news) !!! thank you! Wow. I'm sort of speechless. Thank you for this lesson about listening to our children. Thank you for sharing this. Such a testament to learning about ourselves, getting in touch with our heart's desires and true needs, and communicating it with others. Such deep insight.